The United States is increasingly similar to a 3rd world county in several ways and is accelerating towards 3rd world status. Economic data indicate a harsh reality that obviates mainstream political debate. The evidence suggests that, without fundamental reforms, the U.S. will become a post industrial neo-3rd-world country by 2032. Fundamental characteristics that define a 3rd world country include high unemployment, lack of economic opportunity, low wages, widespread poverty, extreme concentration of wealth, unsustainable government debt, control of the government by international banks and multinational corporations, weak rule of law and counterproductive government policies. All of these characteristics are evident in the U.S. today. Other factors include poor public health, nutrition and education, as well as lack of infrastructure. Public health and nutrition in the U.S., while below European standards, stand well above those of 3rd world countries. American public education now ranks behind poorer countries, like Estonia, but remains superior to that of 3rd world countries. While crumbling infrastructure can be seen in cities across America, the vast infrastructure of the United States cannot be compared to a 3rd world country. However, all of these factors will rapidly deteriorate in a declining economy. 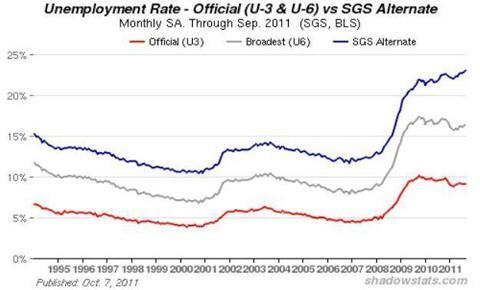 Unemployment, which is a deep, structural problem in the U.S., is a fundamental challenge to economic opportunity. 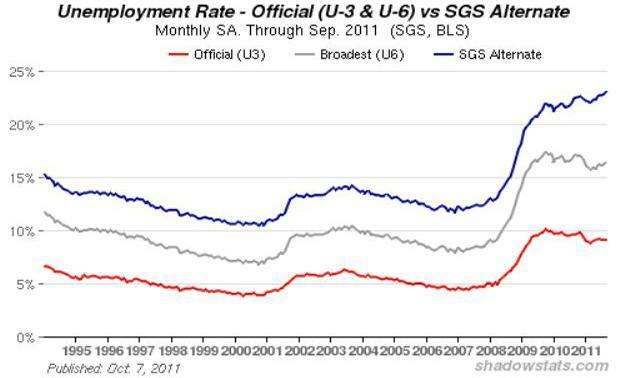 The U.S. labor market is in a long-term downward trend linked to globalization, i.e., offshoring of manufacturing, outsourcing of jobs and deindustrialization. 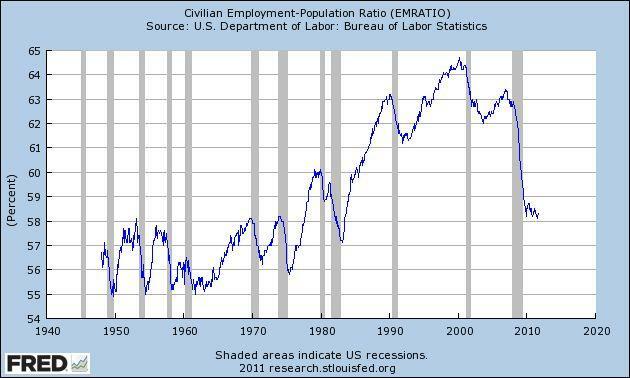 The U.S. workforce has declined by approximately 6.5% since its year 2000 peak to roughly 58.2% of working age adults and the U.S. now suffers chronic unemployment of 9.1%. Although the workforce grew in the 1980s and 1990s, as dual income families became the norm, the size of the workforce is shrinking due to a lack of economic opportunity. Officially, long-term unemployment is 16.5% (.pdf) and the ranks of the long-term unemployed (.pdf) (those jobless for 27 weeks and over) include 5.9 million, 42.4% of those unemployed. However, prior to the Clinton administration, unemployment measures included workers who are now no longer counted as part of the workforce. Using the more accurate pre-Clinton criteria, unemployment exceeds 22%, only 3% below the worst point (24.9%) of the Great Depression. For countries with populations greater than 2 million, Macedonia leads the world with 33.8% unemployment, followed by Armenia at 28.6%, Algeria at 27.3% and the West Bank and the Gaza Strip both at 25.7%. Compounding the unemployment problem is the fact that an entire generation of young Americans is being left behind in terms of economic opportunity. Student loans exceed $1 trillion while the labor force participation rate for those aged 16 to 29 who are working or looking for work fell to 48.8% in 2011, the lowest level ever recorded. Lack of economic opportunity among the youth, including millions of unemployed college graduates, is a political wildcard reminiscent of countries like Tunisia. The structural decline of the U.S. labor market will continue as American workers are merged into a global labor pool in which they cannot yet directly compete for jobs with workers in countries like China and India. In China, for example, gross pay, in terms of purchasing power parity, is equivalent to approximately $514 per month, 57% below the U.S. poverty line. According to the Economic Policy Institute, the U.S. trade deficit with China alone caused a loss of 2.8 million U.S. jobs since 2001. Workers earning more dollars are actually poorer in terms of purchasing power when the cost of living rises faster than wages,. In fact, if household income is adjusted for inflation, most American families have grown significantly poorer over the past ten years. 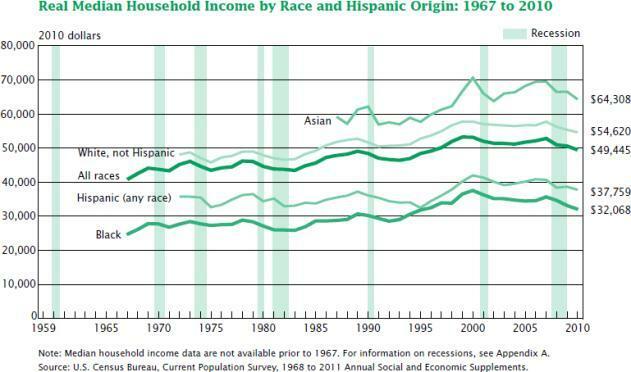 In 2010, for example, real median household income fell 2.3%. Although the average wage has risen steadily in nominal terms, dwindling purchasing power is a reality for most Americans. 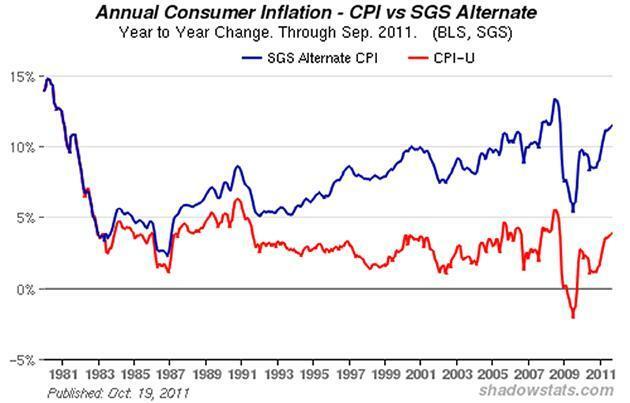 When adjusted for inflation, the wages of most Americans have not kept up with the Consumer Price Index (CPI). 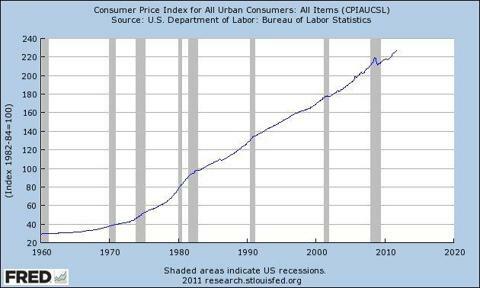 According to famed economist Milton Friedman, “inflation is always and everywhere a monetary phenomenon.” In other words, prices rise when the money supply is increased faster than population or sustainable economic activity. Apparent economic growth created through credit expansion, i.e., by increasing the money supply, has a temporary stimulative effect but also causes prices to rise. 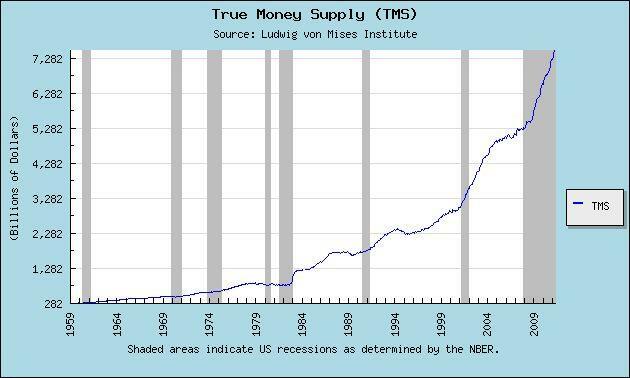 True Money Supply is an accurate measure of inflation. Although CPI is sufficient to illustrate declining real wages, CPI does not measure the cost of living in a realistic way. According to economist John Williams of Shadow Government Statistics, CPI systematically understates inflation. The decline in real household income has set Americans back to 1996 levels, despite many households now having two incomes rather than one. 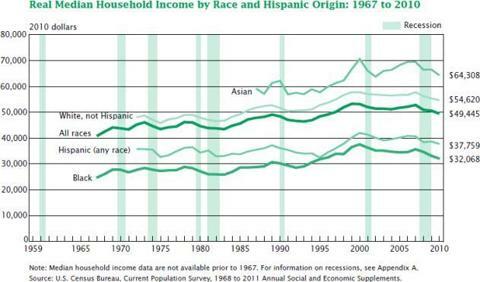 Dual income families accounted for much of the increase in real median household income during the 1980s and 1990s, but, today, two incomes are barely better than one income was three decades ago. The decline in real wages was obfuscated in the 1980s and 1990s by growth in the workforce, e.g., by women entering the workforce. Real median household income rose while real wages declined because more households had two incomes. As U.S. wages and household income continue to fall in real terms, both poverty and reliance on government assistance programs will continue to rise. 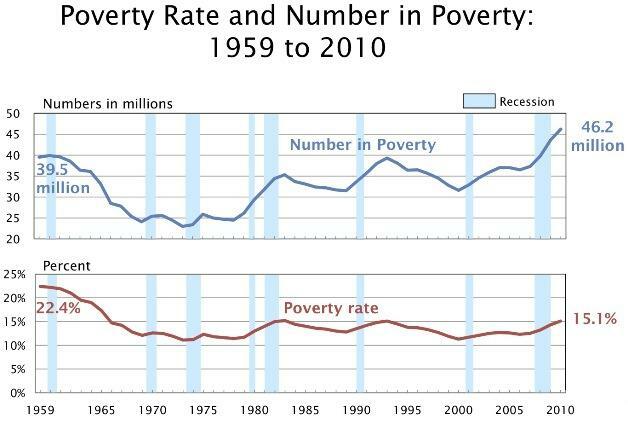 According to the U.S. Census Bureau, the poverty rate in the United States rose to 15.7% in 2011, with 47.8 million Americans living in poverty (1 in 6). The official poverty line, determined by the U.S. Department of Health and Human Services, is $22,314 for a family of four. 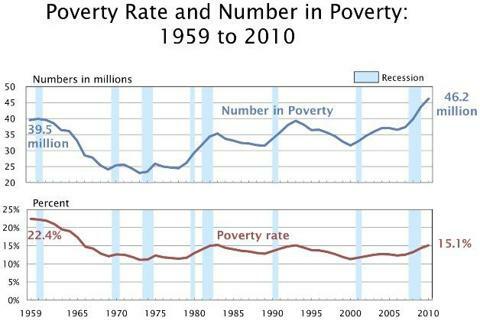 The number of families living in poverty has risen sharply since 2006 and continues to climb. The U.S. Department of Agriculture’s Supplemental Nutrition Assistance Program (SNAP), commonly known as “food stamps,” serves 45.8 million households as of May 2011. 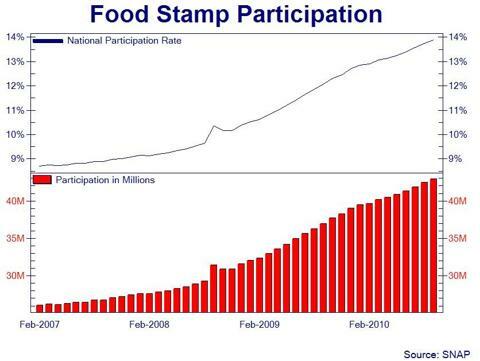 The program now feeds 1 in 8 Americans and nearly 1 in 4 children. Based on the outlook for employment and wages, both poverty and reliance on government assistance programs will continue to grow. However, the negative trends in employment, wages and poverty have not affected all Americans equally. In fact, the household income and wealth of the wealthiest Americans has increased sharply, despite the overall deterioration of the U.S. economy. Ultimately, we are interested in the question of relative standards of living and … trends in the distribution of wealth, which, more fundamentally than earnings or income, represents a measure of the ability of households to consume. In other words, concentration of wealth undermines the consumer base of the economy, causing GDP to decline and resulting in unemployment, which reduces living standards. Obviously, the total wealth of society is reduced when wealth is highly concentrated because there is a lower overall level of economic activity. 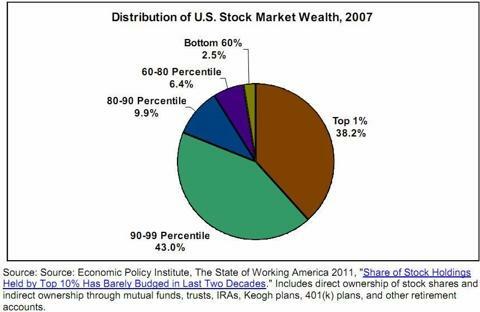 Economic data from several sources, including the Congressional Budget Office (CBO), show that wealth and income in the United States have become increasingly concentrated with the wealthiest 1% of Americans owning 38.2% of stock market assets, e.g., shares of businesses. For the wealthiest 1% of Americans, household income tripled between 1979 and 2007 and has continued to increase while household wealth in the United States has fallen by $7.7 trillion. 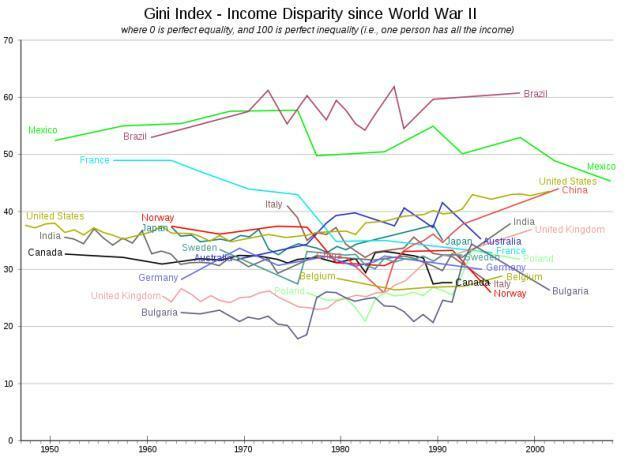 The Gini Coefficient illustrates the growing disparity in income distribution. In terms of the Gini Coefficient, the United States is now at parity with China and will soon overtake Mexico, a still developing country. It should be noted, of course, that the U.S. remains a far wealthier country overall. If the current trend continues, however, the U.S. will resemble a 3rd world country, in terms of the disparity in income distribution, in approximately two decades, i.e., by 2032. 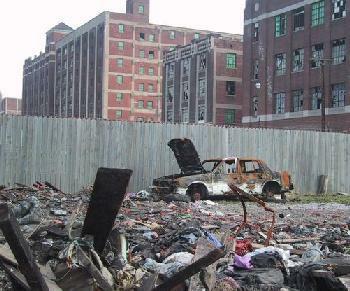 The United States is quickly becoming a post industrial neo-3rd-world country. Partly as a consequence of worsening unemployment and lack of economic opportunity, falling real wages and household incomes, growing poverty and increasing concentration of wealth, the U.S. government faces a historic fiscal crisis. Dominant corporate influence over the U.S. government, particularly by large banks, weakening rule of law at the federal level and destructive tax policies are compounding the economic problems facing the United States. Barring fundamental reforms or a hyperinflationary collapse of the U.S. dollar (due to the fiscal problems of the U.S. government), the deterioration of the U.S. economy will continue and accelerate. As the U.S. economy continues its decline, public health, nutrition and education, as well as the country’s infrastructure, will visibly deteriorate and the 3rd world status of the United States will become apparent. Disclosure: I am long NGD, AG.